Britain's Chris Eubank Jr produced a stunning third-round knockout to defeat Turkey's Avni Yildirim in the super-middleweight World Boxing Super Series. The 28-year-old will face a semi-final against WBA champion George Groves or fellow Briton Jamie Cox, who meet at Wembley Arena on 14 October. Eubank Jr, beaten only once in his previous 26 bouts, put the undefeated Yildirim, 26, on one knee in round one. After a flurry of punches, a crunching left hook provided the knockout blow. 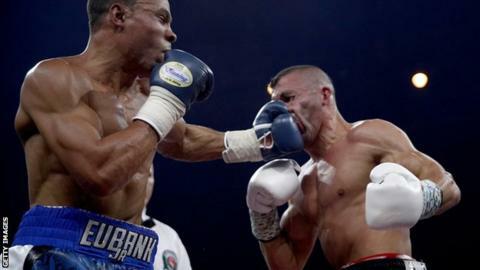 Following his emphatic victory, Eubank Jr said: "I'm here to dominate this tournament. I'm sending a message out there that I'm coming. George Groves, get through your next fight so we can give the boxing fans what they want to see. Asked about Yildirim, the Briton added: "He was a strong, come-forward fighter - but the experience is not there for him. "He was 16-0 but he has to work technically on his abilities to compete with a fighter like me." The contest took place at the Hanns-Martin-Schleyer Halle in Stuttgart, Germany, and before the fighters took to the ring there was briefly trouble among rival fans. Chairs and punches were thrown and pictures posted on social media showed some men left bloodied. Journalist Declan Taylor, who was covering the fight, posted on social media: "Mass brawl has just broken out literally 10ft from press row. Chairs over people's heads, the lot." World championship belts are also on the line in the new event so Eubank Jr, who weighed in a pound under the 12st limit recorded by his opponent, remains IBO world super-middleweight champion. Eubank Jr's only defeat was a controversial split-decision loss to compatriot Billy Joe Saunders at middleweight in November 2014.